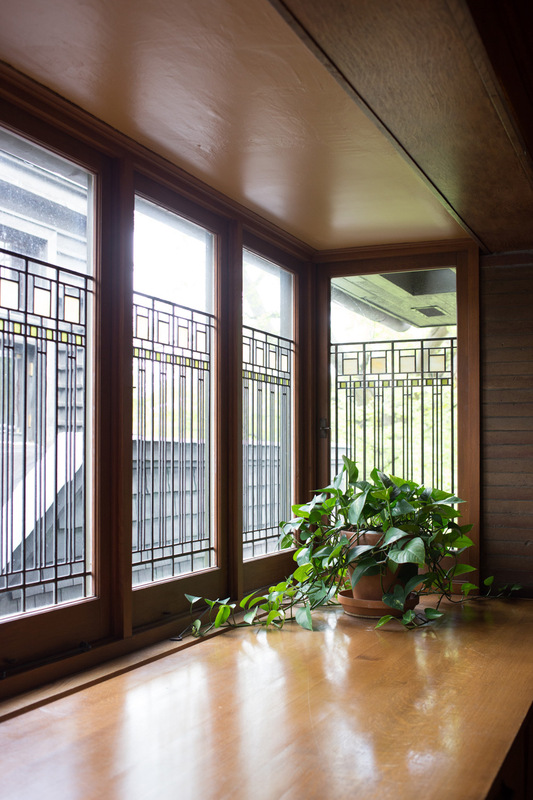 Frank Lloyd Wright is synonymous with iconic American architecture, and thus its impossible for any design aficionado to visit Chicago without a pilgrimage to his home and studio in Oak Park, just outside the city limits. Although my husband, an architect himself, had been here many times, we went once more so I could see this historic landmark where FLW spent about two decades designing multiple homes in the neighborhood and exploring design elements that lead to the famed Prairie Movement. On our last morning in Chicago, we hopped into our rental car after a hearty breakfast at The Robey Cafe and drove away from the skyscrapers into Oak Park, a quintessential American upscale suburbia with lush green lawns and stately Craftsmans. Just down the block is another Chicago landmark- Ernest Hemingway's childhood home, another significant sight worth visiting if you have ample time in the area. I highly recommend arriving early before the tour and doing a leisurely stroll of the neighborhood, where 25 homes and buildings in this small area were designed by Wright, making it the largest collection of Wright's buildings in the world. Oak Park retains its quiet splendor and its quite enjoyable to wander around, imagining it at the time when two great American icons spent time here. Curbed Chicago has a pretty comprehensive description for the walking tour with brief descriptions of the various homes designed/remodeled by Wright. The studio and home is only accessible by guided tour so purchasing timed tickets online before arriving is highly recommended. We milled around the gift shop while waiting for the tour to start and had the luxury of roaming the house with a relatively small group and a very knowledgable guide. It was pretty incredible walking through the drafting room, seeing where the drawings for so many buildings began as sketches and formed into full fledged buildings still standing today. Wandering inside the home structure and taking in the details and intentional way he continued to expand his vision while committing to using particular architectural elements felt pretty inspiring. All the restored details and prized artifacts blew me away by how timeless they remain. Hopefully you'll get a chance to stop by and admire the home as well! FLW was a fan of Japanese prints, many of which were displayed in the studio area. Picturing all of the life and creativity happening in this beautifully lit space. Below are a few of my favorite homes in Oak Park with the FLW stamp, all pretty distinctive and yet belong perfectly on the block.